I hope you all had a great weekend. I’m sorry I still am so behind on blog visiting and responding to comments. Unfortunately my weekend was a bit focused on my job search so mostly everything else fell by the wayside. I will get caught up soon. I did have the chance though to go to The Writing Barn. I had no idea this wonderful creative space existed! They have workshops, events and rental space to nurture writers. I need to check out some of their classes and maybe one of these days I’ll be inspired to try it out but this time I was there for a book group friend who was launching her book. 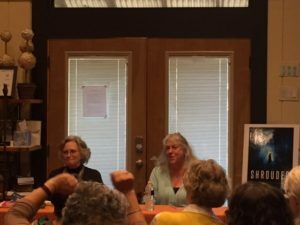 Shrouded is the work of Meredith Lee, the pen name for Austin writers Dixie Lee Evatt and Sue Meredith Cleveland. I know Dixie from my mystery book group and I remember when she told us about a year ago that she was working on her book. It’s so exciting to see the actual copy. There was a nice size crowd for the launch and we got to hear a bit about how the two work and the research they did as well as got to listen to both read some excerpts from the book. If it wasn’t for the fact that I’m a bit behind on a read I need to finish for our book group, I would have started this one. Here is a bit about Shrouded from the publisher: American grad student, Crispin Leads, is at the Vatican to study burial rituals and catch up with her friend, Sister Lew. Within hours of her arrival, Crispin witnesses a murder and is drawn into an investigation of multiple homicides. Meet ups with a young priest, Father Roberto Rossini, seem coincidental but she soon learns that little is left to happenstance in this palace of games. When Lew disappears, blame falls on Crispin and Roberto. Desperate to find Lew and prove their innocence, they make a run for it. In the days that follow they escape death and torture as they unravel the secrets of an unholy plot. You can read more about the writing team on the Meredith Lee website. I look forward to reading this one soon. It takes a long time to settle back into life when returning from vacation, even when it’s a relatively simple and short holiday, domestic and just a long weekend or something easy). You’ll be back into a routine before long! I wish you luck with the job search, Iliana. I know how stressful it can be. 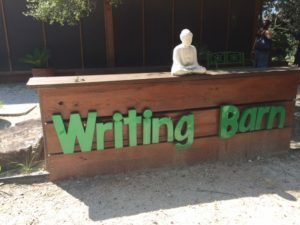 The Writing Barn sounds like an amazing place! That was nice of you to be there for your friend at her book launch! It sounds like it went well. The book sounds really good! I’ve added it to my wish list. I hope you have a good week, Iliana! I’m sending good thoughts and vibes your way.